Difficult is it to keep Singaporeans away from the fun? Most obviously. Singaporeans are one of the liveliest communities in the world, who knows the best way to earn money and have even better ways to spend money on fun and entertainment to live the life fullest. Doesn’t matter if you are not a Singaporean but visiting the pearl of Southeast Asia for fun and enjoyment. We; at SSA, introducing you to the Southeast Asia’s is only kind and thrill-filled ride of fun and entertainment; Adventure Cove Waterpark, which is an aquatic adventure park that offers fun and entertainment to people of every age. Located at Resorts World Sentosa, Adventure Cove Waterpark can easily be accessed from the mainland over the short bridge near the harbor front. Indulge in an endless splash of enchanting fun and rip-roaring entertainment. 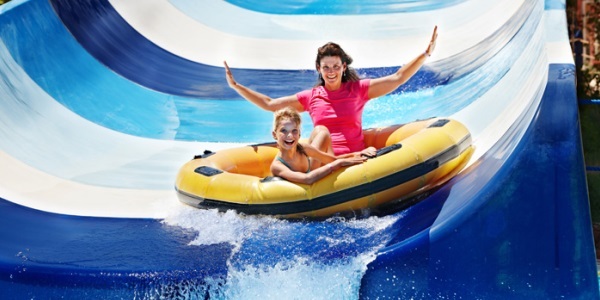 Brave the adrenaline rush as you zoom down thrilling waterslides, such as Spiral Washout and Hydro-Magnetic Coaster or chill out with family and friends in the Bluwater Bay wave pool. 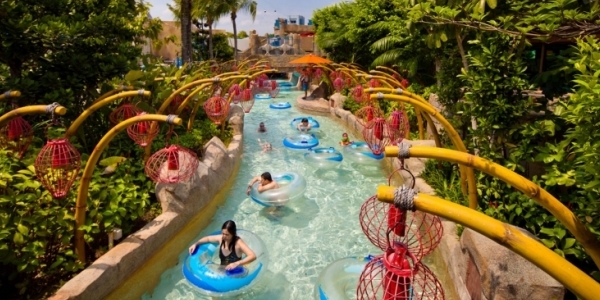 Be more circumspect and have a hand on a tube to journey down the Adventure River, capturing 14 spectacular scenes, including a tropical jungle garden and a grotto inhabited by whimsical sea creatures. Nope, you are not done yet. 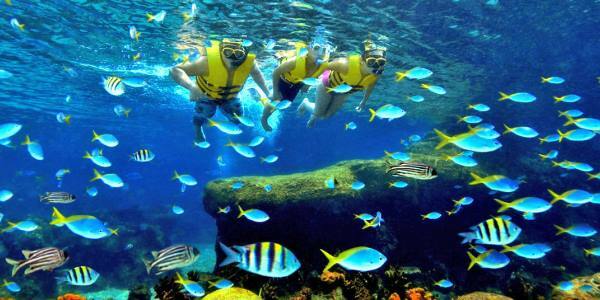 Stimulate your senses with snorkeling over a colorful coral reef with 20,000 friendly fishes playing hide-and-seek. Your day of wet and wild fun will find it worthy to be at Adventure Cove Waterpark, when you get to swim with the fishes in a Ray Bay. Get up-close to the majestic rays and lightly touch the velvety wings of fishes as they swim past you. For sure, you and your kids as well as friends will remain occupied with stunning water rides as Adventure Cove Waterpark offers the plethora of attractions. Nope, they are not done with water rides, a few on-site facilities will help you maximize your fun quotient. You don‘t need to leave the park for the food as the Bay Restaurant serves up Asian and western favorites outside on a nice alfresco dining area. A shop stocks all the essentials you need in the waterpark; starting from swimming shorts to sun screen lotion and of course some branded souvenirs to take home. Take a look at some of the most adrenaline-filled ride for adults and cute yet fascinating rides for the kids. This is the first hydro-magnetic coaster in the Southeast Asia. More heart-throbbing than an actual rollercoaster, this Riptide Rocket makes you go through the powerful climbs, plunging drops, terrifying twists and tight turns to set your adrenaline pumping. Not literally, but ride a water tornado in the dark. Feel the blood-rush of dropping through an elevated chute that sends you careening down banked turns, radical twists and dips before splashing out in a pool of water. 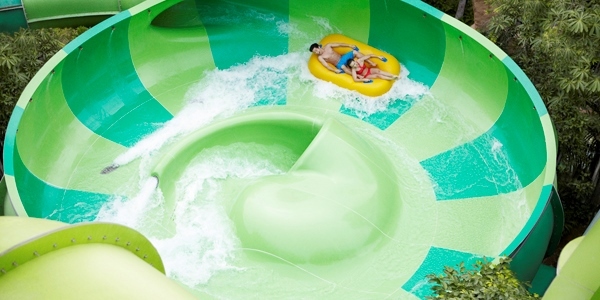 For a safety reasons, you may find some rides restricted for adults only at Adventure Cove Waterpark, but need no worries as the waterpark has an adventurous array of water rides for the kids well. 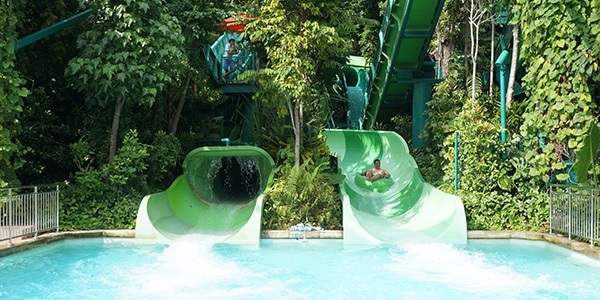 Grab a tube and take a leisurely ride down Adventure River, floating through 14 stunning habitats, including a lush jungle garden, a mysterious grotto and an underwater tunnel in a sea of marine life swimming above and around you. 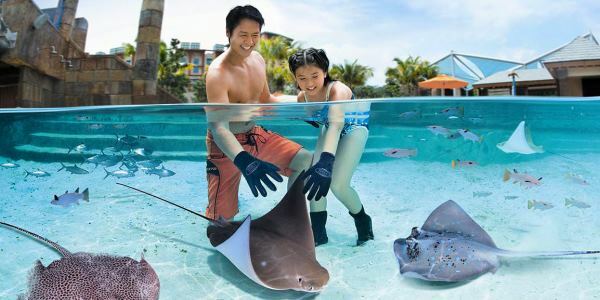 For the adventure lovers in Singapore and world across, Adventure Cove Waterpark has slashed the all-inclusive prices from S$36 to 28.70 per person. Do you wish to save more; like 20% more on adventure park tickets, click here to avail discount and save more.